In order to provide the goal line technology in football, British firm ‘Hawkeye’ has been given the contract to introduce the system in Barclays Premier League matches starting from next season. A meeting between 20 top level clubs was held regarding the choice of the technology and the final decision was given in favour of Hawkeye. The decision was made based on low cost, ease of equipment installation and user friendliness of the system. Hawkeye will use camera systems installed in the sports fields/stadiums to establish the occurrence of goal or otherwise. The technology is already being used in cricket and tennis to determine the original position of the ball where it made impact. Starting from the next season, the company will install the goal line technology cameras in all the stadiums in Barclays Premier League. Hawkeye was approached by football unions in 2007 to provide a technology to assist linesmen and referees in giving goal decisions. Another technology known as ‘Goal Control’ has also been under consideration which has been given contract for Confederations Cup in Brazil and World Cup Finals next year. It is a German system which also uses cameras. FIFA has also given license to two other German companies to introduce the system for goal assistance which use magnetic sensors instead of cameras. 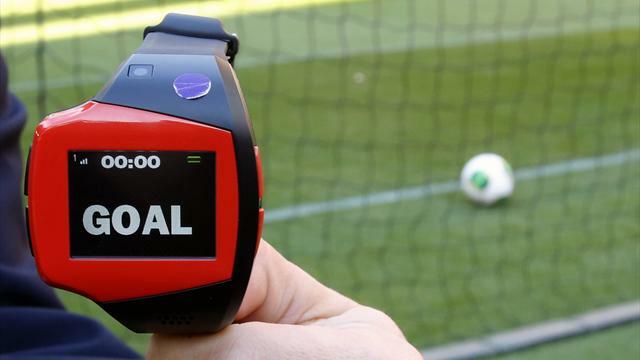 The system also introduces a wrist watch to be worn by linesmen in which the word ‘Goal’ is displayed in case the ball crosses the goal line.